ELIZABETH CITY, NC ––The 2016 Chevrolet Suburban has everything you’ve come to expect from Chevrolet plus uncommon spaciousness and unmatched safety. The Suburban is an American Original that packs performance for any occasion. 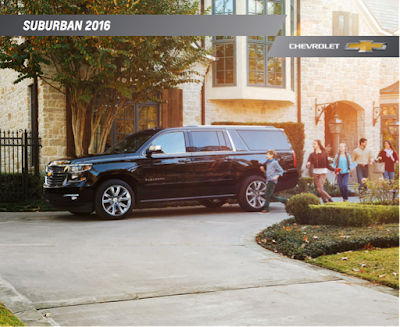 Learn all about its safety and performance by downloading the 2016 Chevrolet Suburban brochure below. On the exterior the 2016 Chevrolet Suburban has looks to kill with a striking design and crisp profile. The Suburban also has a luxury feel inside with smart ergonomics, soft touches, and upscale materials complete with all the room you want and need. You’ll enjoy the smart cargo and storage design throughout. A stunning 121.7 cubic feet of cargo space is quickly available with the fastest available power-release second row and power-folding third-row seats. Technology you’ve come rely on comes standard with the 8-inch color touch screen. Chevrolet My Link, Bluetooth, Sirius XM, rear Blu-ray system, and standard OnStar built-in 4G LTE Wi-Fi will keep you connected and entertained. The 2016 Suburban is the first vehicle in its class with standard Apple CarPlay compatibility, which allows you to access and use your favorite apps through the touch screen. For all the technology details download the brochure. When you decide these features are what your family needs in an SUV, stop by Perry Auto Group to purchase or lease your 2016 Chevrolet Suburban. Perry Auto Group has two dealership locations to serve you better at 1005 W. Ehringhaus St, Elizabeth City, NC, 27909 or 1001 Halstead Blvd Elizabeth City, NC 27909. Stop in for any of your auto or community needs, or feel free to give us a call at (252) 338-9100.